Thermal and structural analysis of the ITPS is done on either a unit cell or quarter panel model ITPS model using the ABAQUS finite element software. In the unit cell model shown below, heat influx is incident on the top face sheet and it is assumed all heat is either transferred into the ITPS or radiated out to the surroundings. The periodic boundary conditions prevent heat lateral heat loss. The bottom face sheet is perfectly insulated to simulate the worst case scenario where the bottom face sheet temperature rises to the maximum as it is unable to dissipate heat. The trajectory and body point on the vehicle dictate the input heat influx and pressure profile used in the analysis. Thermally, we consider failure to be exceeding the maximum allowable temperature of a material or violating any given temperature limit. The bottom face sheet temperature is of particular interest due to its proximity to the underlying vehicle structure. Structurally, we consider the buckling behavior of all components, stress, and deflection. 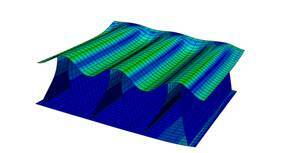 With these finite element models and proper sampling of designs, we are able to build response surface approximations that allow cheap calculations, such as the maximum bottom face sheet temperature, buckling eigenvalues, and stresses.